OVERLAND PARK, Kansas (July 12, 2017) - Weaver, an industry leader in high-performance optics and mounting systems for more than 80 years, continues its quest to produce the best mounting solutions on the market by introducing the new Premium MSR Mount. A specialized modern sporting rifle deserves high-quality accessories. The Weaver Premium Modern Sporting Rifle (MSR) Optics Mount is designed specifically for MSR rifles. The Premium MSR Optics Mount lives up to its name, starting with its construction. The anodized Type III hardcoat black matte finish adds further protection and blends in seamlessly with the rifle. The sleek design sets optics at the ideal height, with a forward cantilever for MSR rifles. The edges are slightly radiused to prevent snagging. 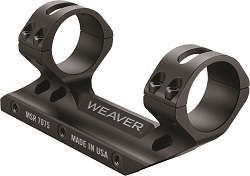 The Weaver Premium MSR Optics Mount adds an extra layer of durability and performance, but hardly any weight. Available in 1 inch, 30 mm and 34 mm options, the Premium MSR Mount also features double recoil lugs to lock the mount in place and premium 7075-T6 aircraft-grade aluminum construction. Weighing in at just 6 oz., the mount also offers Torx-head screws with three oversized #25 Torx crossbolts with steel-threaded inserts. Weaver, a Vista Outdoor brand, has more than 80 years of experience creating the world’s most reliable optics and mounting systems. For more information, visit www.weaveroptics.com..